Does your Sim look anything like this: My Sims look horrible ? Do you have clothing, hair or objects in your game that you do not like at all and don’t remember downloading anywhere ? If so, you have probably downloaded Custom Content (CC) with a house/sim or household from the Exchange or any other third party site. This tutorial is meant to help you find the stuff and get it out of your game. There are several steps involved and sometimes there is more than one way to do it. I will try to explain everything as easy understandable as possible. If you do have any problems with this, please post in my Bad CC thread in the official Sims 3 forum. I’m checking this thread regularly and will try to help where ever I can. If you find them there, continue with Removing unwanted CC. If you don’t find the items on my lists, you will need to start your game and find out, what KIND of cc you have. The launcher as well as CAS/Build/Buy Menu have little icons next to clothing/objects/etc. Those icons give you an indication where the item came from. This lets you easily distinguish if something is a third party content or came from the Sims3 Store. Houses, worlds and Sims that you download from the Exchange or other sites are displayed as CC. CAS/Build and Buy Mode have some extra icons but the red flower that indicates cc does not display. All downloads that are installed through the launcher show as if they were bought in the Store. Clothing and objects without an icon are from the base game. Folder icons can be package files, files that came directly with a Sim or something you saved ingame. There's no way to distinguish between the three. You should know what you created yourself though. 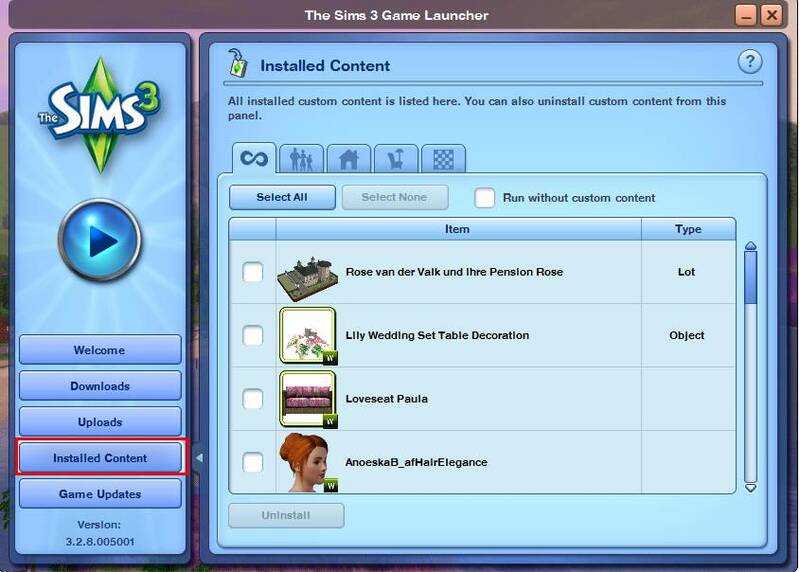 The Store Icon was supposed to be for Store items and all other Sims3Packs should have the red flower like presented in the launcher. 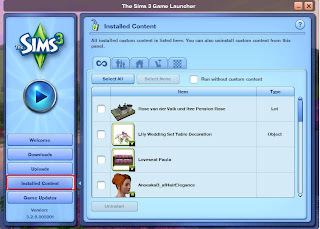 For whatever reason all Sims3Packs are displayed with the Store Icon ingame. Depending on what type of CC it is, you need to remove it differently. Package files can be either found in your mods folder OR they came with a Sim directly. Either way, you will need to do the binary-search method (aka the 50% method) to find the guilty party. Skins ALWAYS come this way unless you put them in yourself. Once you identified them, you can simply delete (or move) the file you want to get rid of. Make sure to delete your cache files afterwards. If you are using Scripting Mods (like the ones by Twallan, Buzzler or treeag) make sure that you read the description of the mods. There are certain mods that need some extra steps before uninstalling them. Those file need to be uninstalled from your launcher. Make sure, you check your Installed Content and not Downloads. Also make sure that you have the tab with the Infinity Symbol to see all your installed stuff. Some of these unwanted files do not have a categorization and therefor can’t be found if you filter f.e. by Clothing. Do not try to uninstall while the game is running. Close it. Find the Launcher Pic/ text you have identified before. Start your game to check if the unwanted CC is now really gone. If not, try deleting your cache files. To rid your computer of clutter, you should also delete the corresponding package-file in your DCBackup folder. You’ll find the numbers in my blog if the CC is listed there. This step is NOT necessary and has nothing to do whether they show up in your game or not. To read up on what those files are actually for, read this: User Files. Make sure WHAT type of CC it is by identifying the icon in CAS (see above). If uninstalling an item from the Launcher does remove the CC from your game. Unfortunately the launcher doesn’t seem to be able to display all CC if you have a lot of it so that’s why sometimes you can’t seem to find stuff. Remove the dcdb0.dbc file from the DCCache and store it in a safe place. Move the dcdb1.dbc in the DCCache and rename it to dcdb0.dbc. Start the launcher and proceed with step 5 and 6 again. Do this for every DBC file in the DCCache Folder. Make sure to rename the files to their original name. Once your done, move the cleaned files back to your DCCache folder and you're done. You can then try deleting the missingdeps.idx if that does not work, you will need to remove all files *.dbc. Move the files to your desktop (don’t delete). This will remove everything except Store Items, Houses/Households and Sims. Check your game if the CC is now gone. Move your SavedSims folder to the desktop and delete your cache files. Move your Mods folder to the desktop and delete your cache files. If not, please post here: Bad CC thread in the official Sims 3 forum.